This classic Spanish dish originated Valencia has earned its popularity around the world. My daughter once cooked this dish to entertain the whole family. It’s simple and tasty, became a big hit in the family. Saffron threads are used traditionally when it comes to cooking this one-pan rice, yet it can be a free style of combinations of meat, seafood and vegetables. I tweaked it with using turmeric powder, instead of saffron threads, that is compared less expensive available here, with a satisfied end result. Season chicken, fish and prawns with salt and pepper. Set aside. Heat oil in a large frying pan. Cook chorizo over medium heat until lightly brown. Add chicken and cook until the surface turns white, no need to be cooked through at this stage. Set aside. Add a little oil to sauté onion until translucent. Add capsicum. Stir to combine and push vegetables to the sides of your pan. Add garlic in the middle and cook until fragrant, yet don’t burn it. Add turmeric powder, cayenne powder and ground paprika and cook until aromatic. Add rice and stir to combine. Pour chicken broth into the pan. Add bay leaf. Toss back the chorizo and chicken. Bring it to a boil. Simmer for about 15 minutes with cover until the rice is almost done. Add prawns, fish, calamari and mussels. Cook for another 3 minutes. Add tomatoes and cook for another 2 minutes. Sprinkle parsley on top. Serve immediately with lemon wedges and salad. Traditionally, saffron threads are used as a key ingredient that helps add fragrance and a beautiful colour to the rice. Simply soak a few saffron threads in a few tablespoons of hot water (or hot chicken broth). Then put it into the rice to cook with the chicken broth in step 4. The amount of cayenne and paprika can be adjusted according to your preference. 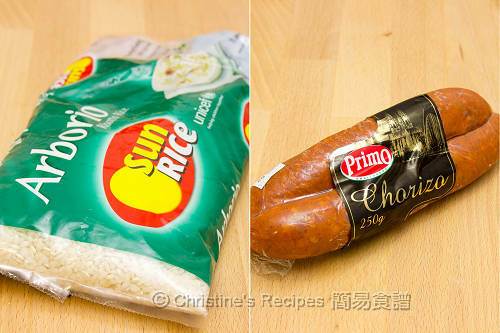 If not using Aboriso rice, you can replace it with short-grain rice. Due to different absorption of different rice and different power levels of utensils used, please adjust the amount of chicken broth accordingly. 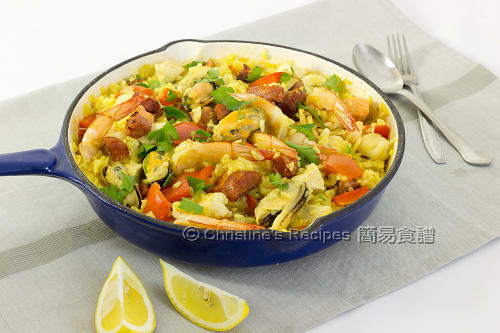 this Spanish rice look yummy, you are so generous with ingredients added in :D.
Paella is such an yummy dish!! What is the brand of the pan shown. Thanks. 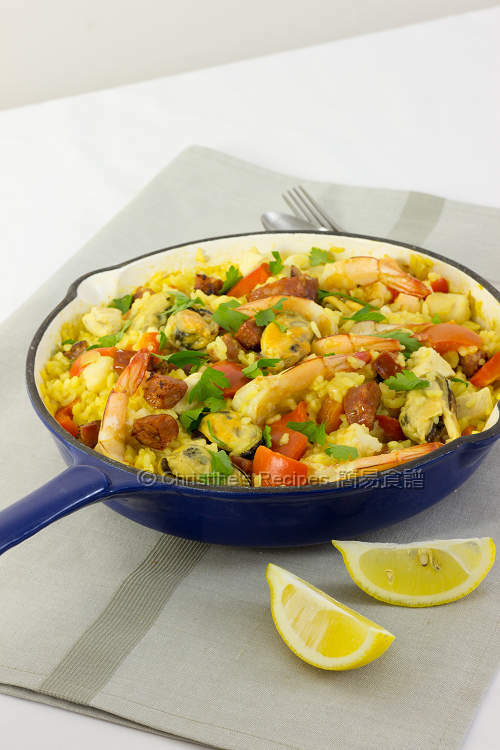 I have not tried making paella at home before. It always seems intimidating to me.